Aquatix ensures its aqua playgrounds are fun for the whole family by arranging products in age-appropriate zones with careful consideration for comfort, safety and enhanced play value. 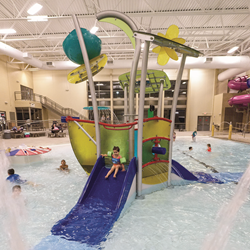 Aquatix by Landscape Structures, an Eden Prairie, Minn.-based aqua play equipment designer, engineer and fabricator, has introduced new aqua playstructures, HydraHub1 and HydraHub2, designed to encourage active play among children of all ages. With the sophisticated design, innovative use of materials and level of interactivity on these playstructures, aqua play will never be the same. The HydraHub1 delivers a dynamic aqua play experience with its various activities. The combination of a pull-string roof diverter, central pivot sprayer, HydroCannons and small bubblers all on raised platforms allows kids to direct their own water experiences. Plus, two whooshing slides provide easy access to the water, where they can run to get splashed by the VersoSplash™ dumping bucket up above. To deliver two times the fun, the HydraHub2 combines the HydraHub1with another raised platform structure filled with interactive experiences. The platforms are linked by a bridge and tunnel with water effects that kids must dodge or be doused. A play panel lets kids tip water-filled buckets on friends below. The addition of a tube slide and a custom three-person wide slide offers a thrilling ride to more water fun below. Kids will have a hard time staying dry on this sprawling aqua playground structure. Aquatix can help build splash pads for any size or location, from a small neighborhood park to a huge family entertainment complex. Aquatic designers can choose from a wide variety of standard aqua play products or collaborate with Aquatix designers to develop a fantastic theme for your splash pad. Best of all, Aquatix ensures its aqua playgrounds are fun for the whole family by arranging products in age-appropriate zones with careful consideration for comfort, safety and enhanced play value. Get more details about the HydraHub1 and HydraHub2, and learn how to develop an aqua play environment the whole family will enjoy at aquatix.playlsi.com. With more than 30 years of water experience, Aquatix is a leader in water feature and spray park design, fabrication and construction. Pioneering integrated recirculation systems, the company provides a sustainable solution that empowers hours of innovative activity without water consumption limits. Now we’re entering a whole new dimension. By joining forces with leading playground equipment manufacturer Landscape Structures Inc., Aquatix will apply the ground breaking design and innovation they are known for to the creation of imaginative new water experiences.